This page describes how to install and configure the Magento Order Management System (OMS) for Magento using a connector. Obtain OMS connector repository access credentials. Get access to the Magento 2 server via SSH. Install Composer on your Magento 2 server. 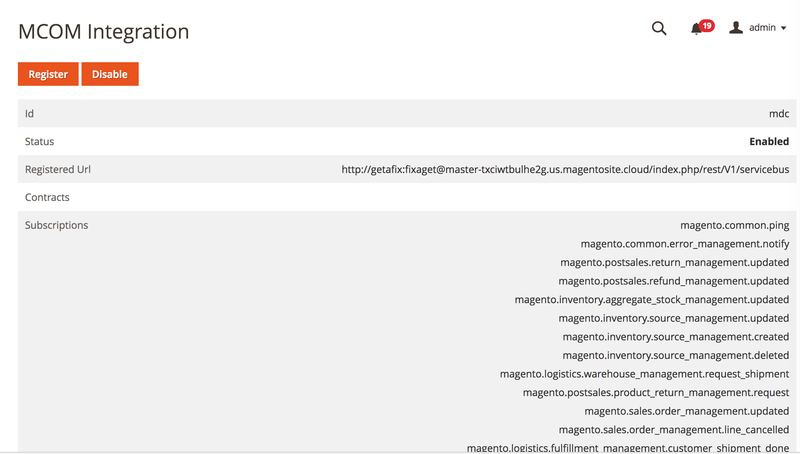 Connect to your Magento installation and navigate to your Magento root directory. Replace public-key and private-key with your OMS authentication credentials. In order the check the latest available version of the connector you can check the changelog. Navigate to Admin > System > System Report > New Report > Modules. After the report generates, click View to see all module versions. See what changes were released in each version of the connector via the changelog in MCOM > Change log. Magento will prepare and send all authorized orders to the OMS. The OMS notifies Magento Commerce about order status changes via the magento.sales.order_management.updated message. Sales channel ID: The external ID of the defined sales channel in your OMS. You can find it in Stores > Configuration > MCOM CONNECTOR > General > Sales Channel ID. The incoming messages in Magento Commerce can be processed in a asynchronous (recommended) or synchronous mode. The orders can be exported to the OMS in an asynchronous (recommended) or synchronous mode. The asynchronous mode of processing messages is highly recommended to avoid application timeouts when big sized messages, such as stock updates, are received in Magento Commerce. The messages are temporarily stored in the database and then later processed by Cron. With a synchronous configuration, you need to run the cron group oms_process_messages. This also helps with concurrency issues since the messages are processed sequentially. If the order export is configured in an asynchronous mode, you can define which orders have specific order statuses that should be exported to the OMS. This is especially helpful with orders that still need to be validated in Magento Commerce, as these orders are not exported immediately. To allow the OMS connector to join with the OMS API, configure the env.php file using these example values. Make sure you enter correct values specific to your installation for this configuration. Contact your Magento Implementation team to receive your integration configuration information. 'application_id' => 'mdc',                              // Unique integration ID, default to "mdc"
'secret' => 'tCn5Y4XppSuKjriGr8n2gr76dgKIZ9Oa',         // Secret provided to OMS API to calculate signature. Can be any string, recommended length at least 32 symbols. Check to see that your modules were properly installed by validating that the MCOM section is displayed in the Admin menu. This command will clean both cataloginventory_stock_item and cataloginventory_stock_status tables and publish a stock update message for all the existing products in the catalog for all created aggregates with a fake value of 100. After that reindex and clear your cache. The products will be displayed on the front-end. The command and can only be run when Magento is in DEVELOPER mode. The following commands can be used to manage the ‘Export Full Catalog’ tasks from the command line. The command will send to the OMS orders that are not in a valid OMS status. While running setup:upgrade the Magento Digital (or MDC) instance will automatically re-register in your OMS. If the instance is not available while running the setup:upgrade the re-registration will fail, and there is a manual workaround to update the registration to the OMS API layer. After the deploy is completed and the application is available again run the following command. As of today Magento does not support natively custom attributes at order line level. Therefore a plugin should be created for the \Magento\SalesMessageBus\Order\Mapper\LineMapper class to provide such information to OMS.